In television, “blanking” means going to black. 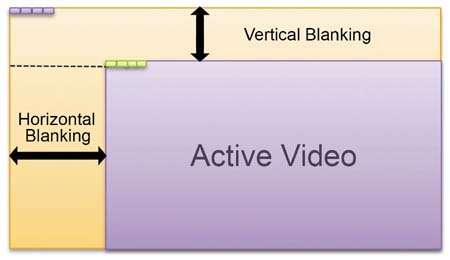 As part of the video signal, blanking voltage is at the black level. Video voltage at the black level cuts off beam current in the picture tube to blank out light from the screen. The purpose of the blanking pulses is to make invisible the re-traces required in scanning. Horizontal blanking pulses at 15,750 Hz blank out the retrace from right to left for each line. Vertical blanking pulses at 60 Hz blank out the retrace from bottom to top for each field. The period of time for horizontal blanking is approximately 16 percent of each H line. The total time for H is 63.5µs, including trace and re-trace. The blanking time for each line then is 63.5 x 0.16 = 10.2 /is. This H blanking time means that the retrace from right to left must be completed within 10.2 As, before the start of visible picture information during the scan from right to left. 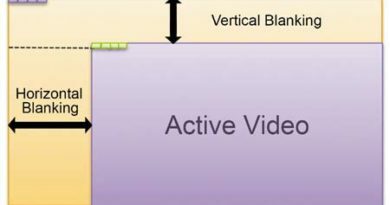 The time for vertical blanking is approximately 8 percent of each V field. The total time for V is 1/6„ s, including the downward trace and upward retrace. The blanking time for each field, then, is ‘/6„ x 0.08 = 0.0013 s. This V blanking time means that, within 0.0013 s, the vertical retrace must be completed from bottom to top of the picture. The retraces occur during blanking time because of synchronization of the scanning. The synchronizing pulses coincide with the start of the retraces. Each horizontal synchronizing pulse is inserted in the video signal within the time of the horizontal blanking pulse. 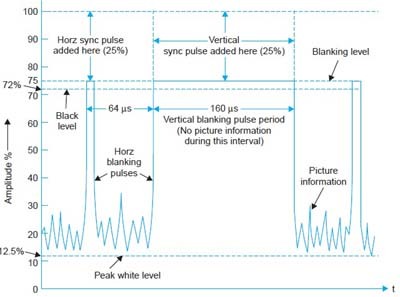 In summary, a blanking pulse comes first to put the video signal at black level; then a synchronizing signal occurs to start the retrace in scanning. This sequence applies to blanking horizontal and vertical retraces. Contains only bright-ness variations of. the picture information, including fine details, as in a monochrome signal. The luminance signal is used to reproduce the picture in black and white. This signal is generally labeled Y signal (not for yellow). Contains the color information. This signal is transmitted as the modulation on a sub carrier at 3.58 MHz for all stations. Therefore 3.58 MHz is the frequency for color. This is generally labeled C signal for chrominance, chroma, or color. In a color television receiver, color signal is combined with luminance signal to recover the original red, green, and blue video signals. These are then used for reproducing the picture in color on the screen of a color picture tube. The color screen has phosphors that produce red, green, and blue fluorescence. All colors can be produced as mixtures of red, green, and blue. A typical color television picture is shown in color plate I. In monochrome receivers, the Y signal reproduces the picture in black and white. The 3.58-MHz color signal is just not used. In this case, 3.58 Mhz is filtered out of the video signal, to prevent interference with the monochrome picture. As a result, the color and monochrome systems are completely compatible. When a program is televised in color, the picture is reproduced in color by color receivers, while monochrome receivers show the picture in black and white. Furthermore, programs televised in monochrome are reproduced in black and white by both monochrome and color receivers. The tricolor picture tube can also reproduce white by combining red, green, and blue.